Martin and Steven have just finished an exhausting, but memorable and rewarding series of days excavating at the Fiskavaig rock shelter on the island of Skye. Due to some poor weather and problems with rockfall at the site, only one day of work was completed during the first week. 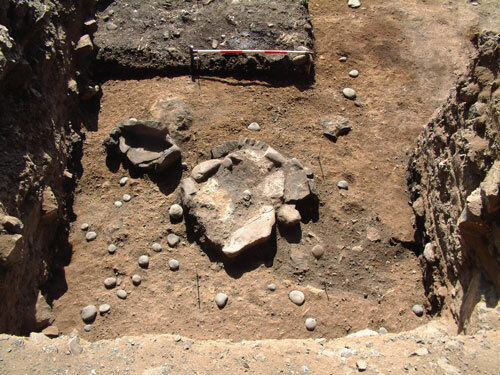 However, we managed a total of five long and arduous days during the second week, over which we undertook some complex excavations and recovered an incredible amount of small finds and copiuos amounts of well-preserved animal bone. 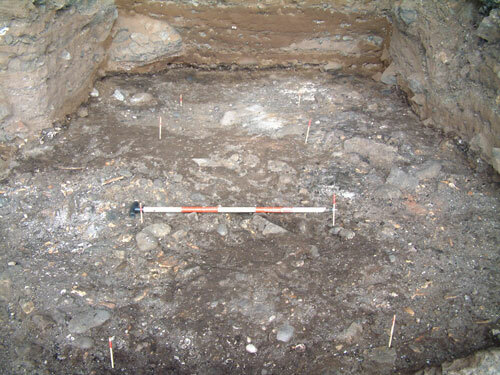 Trench 3, the area of the site we are excavating this year, is seperated by a standing baulk so we can record additional sections through the site. The image above shows excavations in Trench 3 to the south of the baulk including one of the main occupation surfaces, associated midden deposits and two contemporary hearth settings (scale=0.5m). The images above and below show the two slab-built hearth settings after removal of the overlying ash and charcoal deposits (scale=0.5m). The midden deposits within this area to the south of the central baulk included a compact shell midden comprising limpets, periwinkles and mussels, while beyond the limits of the shell midden well-preserved animal bone was recovered - the latter including the semi-articulated remains of prime cattle, pig, red deer, some sheep/goat and part of a mandible fragment from a wolf (including a very large canine!). These features and deposits directly overlay a primary occupation surface that had been levelled using material including small fragments of broken stone with a sediment matrix. 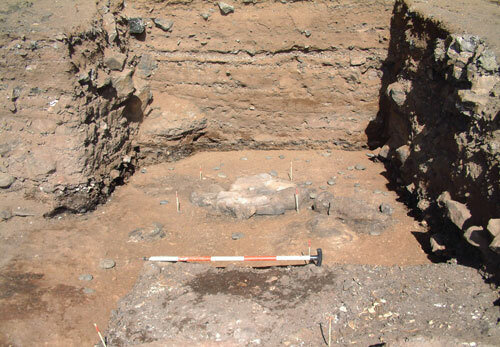 This material can be seen in the image below (scale=1m), which also shows one of the slab-built hearths and a pile of beach pebbles. 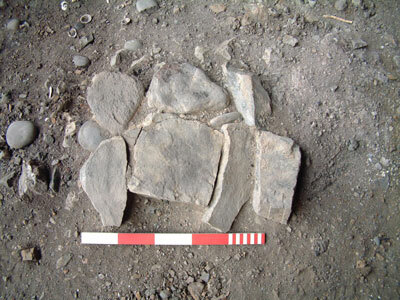 The pebbles may have been used to form an activity surface towards the front edge of the occupation site, or may be material carried into the site from the small beach below to use in cooking or industrial processes (we have recovered significant amounts of fire-cracked pebbles from the site that have been used in such activities). 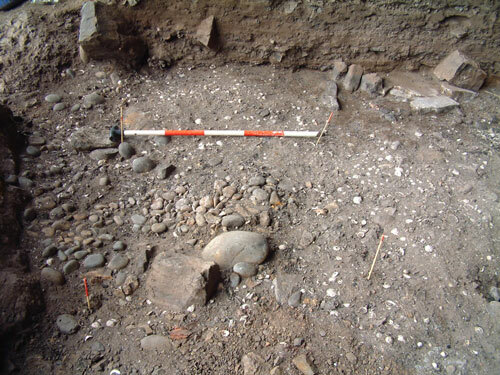 Excavation of the deposits surrounding the major slab-built hearth that disappears under the central baulk revealed an earlier hearth-type feature immediately below, comprising an elongated feature kerbed with upright stone slabs. 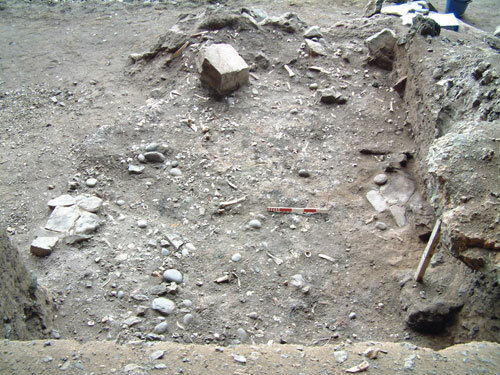 Recording and removal of the upper slab-built hearth revealed the lower feature, which can be seen in the image below. 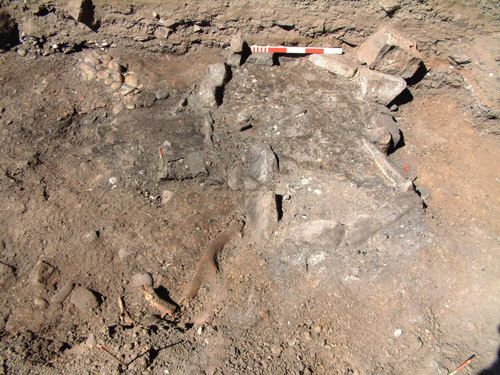 The interior of the feature contains some semi-articulated animal bone, ash and fragments of bronze. Martin recovered a wide range of small finds from this section of Trench 3 including pebble tools, a fine whetstone or burnishing tool, metalworking residues including a large fragment of a furnace base complete with a part of the hole where the bellows pipe was inserted, pottery, worked bone and antler objects, what appears to be a sword or dagger pommel manufactured from ivory and at least three antler picks. 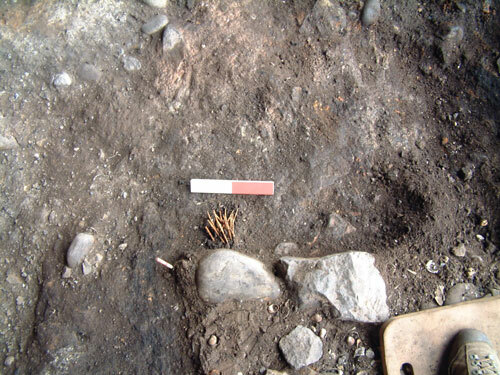 The antler picks were all recovered from the lowest occupation horizon in this part of the site (see image above showing kerbed feature and antler pick) and may have been used to prepare and level the surface of the rock shelter prior to use. 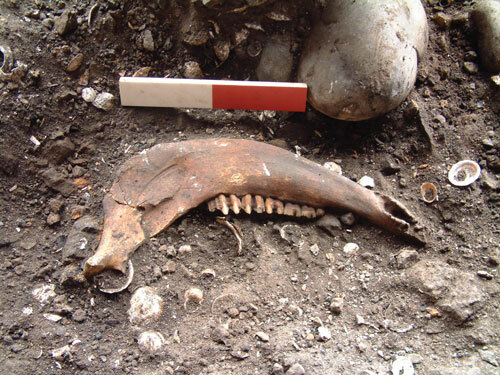 The image below shows a closer view of one of the picks, all of which had been manufactured from large and robust red deer antlers that had been collected from the landscape where they had been naturally shed from the deer. One of the finer antler picks recovered from this part of the site by Martin (scale=0.5m). 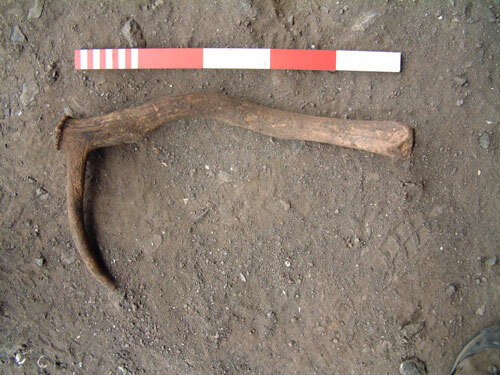 The points of the picks showed wear from use, while tines from the main antler beam had been cut off, possibly to use to manufacture other tools. Martin recovered a fine antler tine point from this part of the site. Within the north sector of Trench 3, Steven was also busy recovering large quantities of animal bone, while he had also uncovered a shellfish midden comprising periwinkle and some limpet, mussel and oyster shells. The midden deposits here also included significant amounts of fire-cracked pebbles, charcoal deposits and spreads of ash from the hearths. 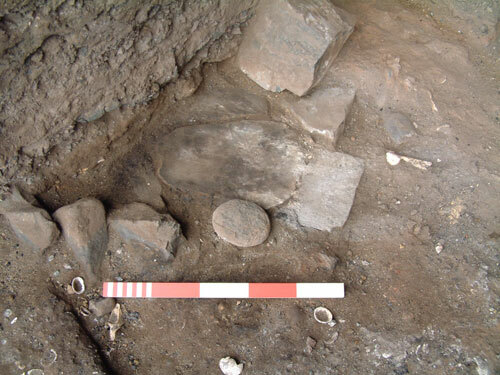 Excavation of these deposits produced metalworking residues of iron and bronze including vitrified crucible fragments, stone tools, a good assemblage of pottery sherds including decorated and plain vessels, and antler and bone items. 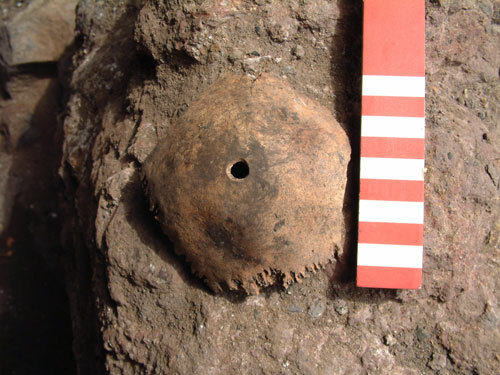 One unusual item was what appears to be a button manufactured from horn, complete with three central attachment holes. 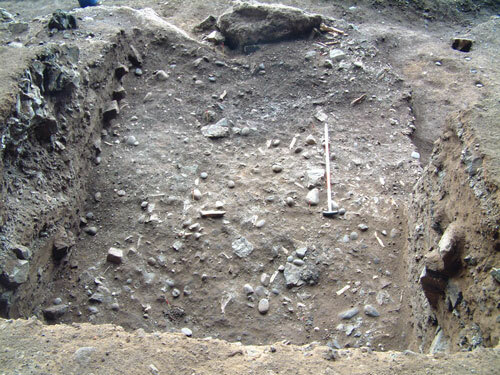 Ash deposits and a few stone slabs also started to emerge in the trench, suggesting the possible presence on an hearth setting below. In the image above note the slabs, some of which are set on edge, and the associated ash deposits. 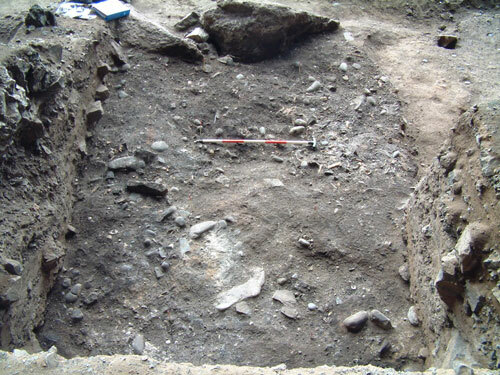 Removal of the archaeological deposits surrounding these potential features eventually revealed two further slab-built hearth settings, which would have been contemporary with the hearths uncovered by Martin in the south sector of Trench 3. The image above shows the excavated features from the west, while their location in relation to each other can be seen better from above (see image below). Other features revealed in this sector of Trench 3 include a series of small post holes and stake holes, which continue into Trench 2 (excavated during 2008 - see previous news reports for details). These most likely relate to partitions and distinct activity zones defined by hurdle fences, and features related to the hearths such as suspension tripods. 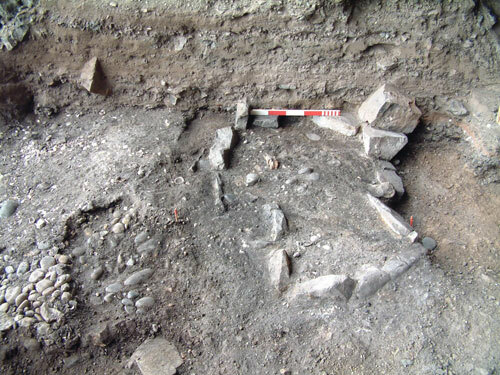 The area of dark deposits running below the main hearth setting is a pit feature containing some bone (this will be excavated later in the year). From our excavations so far at the site it is becoming increasingly apparent that the archaeological deposits continue to the east (towards the back of the rock shelter) and to the south (below the huge amounts of rock and sediments forming the upper section of the talus slopes). We are also recognising distinct areas within the site where deposition of different items and materials have taken place, which we will report on later this year. Excavations during the past week also revealed our first cache of small finds from the site, within the north sector of Trench 3. While excavating ash deposits to the north of the large slab-built hearth and adjacent to a large beach pebble, Steven disturbed a group of fine antler pins. The image above shows the general location of the pins at the time of discovery. Unfortunately, several of the pins were broken by the action of the trowel - but the breaks are clean and the conservators should be able to join these back together. 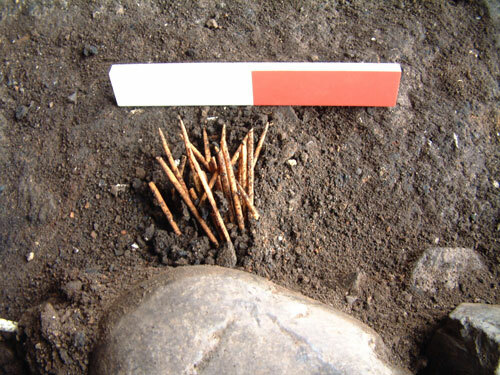 The cache included 24 pins, some of which have polished points, and the find has certain parallels with cache’s of bone points and pins found at the High Pasture Cave site. The image below shows a closer view of the pins at the time of discovery. 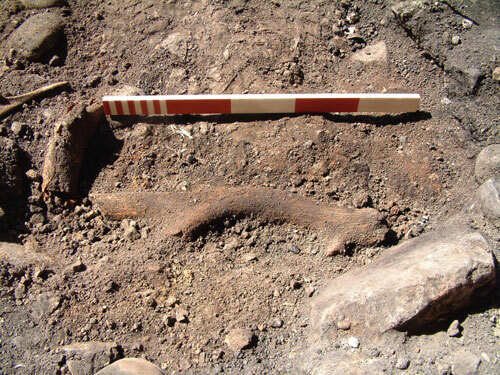 While excavating to the side of one of the hearths, Steven also recovered a more disturbing find - human bone. 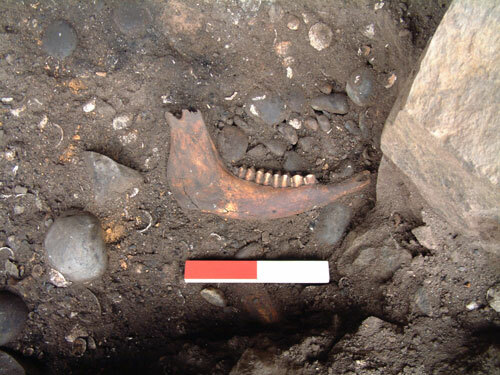 Mixed with animal bone including prime cattle, red deer and sheep/goat, the find comprised the cap of a human skull that had been detached (either naturally or by human modification) at the suture lines. My initial thoughts were that this was possibly a disturbed inhumation, or human material deposited within the midden deposits - a relatively common occurrence on Iron Age sites. The skull fragment was covered in organic-rich sediments and it was only as I brushed some of this carefully away that a more disturbing aspect of the find was made - a small hole had been drilled through the skull fragment! The images above and below show the two sides of the skull fragment immediately after discovery. Initially, our thoughts on the find focused on possible trepanation - a form of surgery potentially used in prehistory to release pressure on the brain. However, a closer look at the find indicated that the skull had been drilled from both sides, indicating that the person was already dead and possibly de-fleshed by the time this modification was carried out. Therefore, what was the purpose of the modification to the human bone? I had recently read through Ian Armit’s excellent publication on his excavations at the Iron Age wheelhouse site at Cnip in the island of Lewis, in the Western Isles of Scotland. Ian also recovered a fragment of human skull at this site, which had been buried within a shallow pit below one of the structures. This skull fragment, from an adult of probable middle age, had also been drilled from the internal and external surfaces. 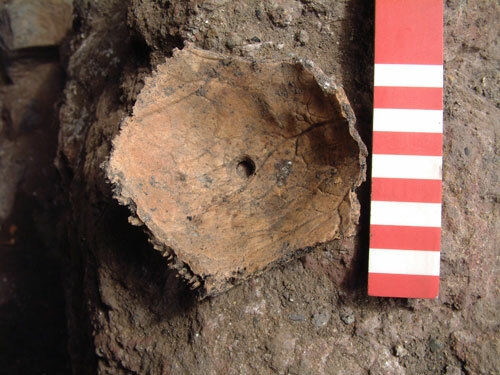 Combined with finds of similar drilled bone from a broch at Hillhead in Caithness, the fort at Burghhead in Moray and the item from Cnip, the drilled skull fragment from the Fiskavaig rock shelter raises wider issues concerning the treatment and curation of human remains during the Iron Age. Similar finds of modified human skull in England and northern France bring to mind the ‘cult of the head’ during the Iron Age. Armit in the Cnip monograph suggests that ‘While far from conclusive, the small sample of human bone from Cnip (and indeed from Hillhead, Burghhead and Hunsbury) is at least consistent with the retention of adult male heads for curation and/or display; a familiar ‘Celtic’ motif, recorded in contemporary Iron Age communities in Gaul, most famously in the works of Posidonius and his successors, notably Diodorus Siculus and Strabo’ (Armit, 2006: 244-5). It has been suggested by Armit and others, that these perforated skull fragments may have been suspended for display.......We will report further on this most unusual and rare find soon. The sheer number of finds, the complexity of the features and the large quantities of animal bone recovered during the excavations, resulted in time running out on us before our return to the High Pasture Cave excavations on the 10th August. 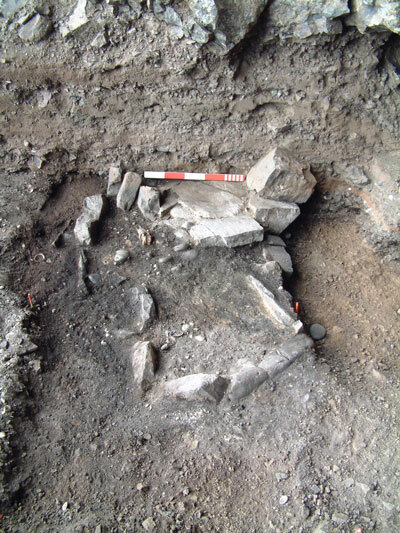 Therefore, we will return to the Fiskavaig site later in the year to complete our work there. Visit the web site again soon.....later this week I will get some images on the Finds Page of the small finds recovered during the past two weeks. 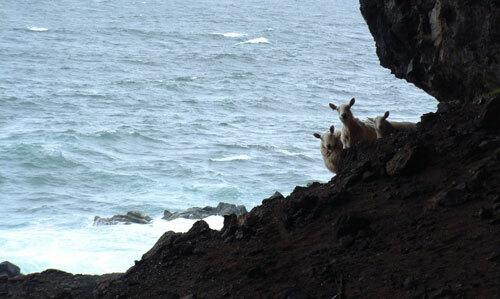 The local inhabitants showing some interest in our work!! As a local it’s encouraging to see the investment being made, both in terms of time and the costs of this research, into the long lost past of the Island. It is a fact that whereever you wonder on Skye you have a sense of the presence of those who were here before, its good to get a scientific assessment of the lives of those long vanished races! My father told me when he got the croft at no 7 Fiscavaig he had to clear the lower field of large stones to make a field that he was able to plough. The stones were large and sunk into the ground in a circle. He had to use a tractor to move them. fine site but the virtual visit is incredibly frustrating.is it just me,my machine,or the way it’s set up ? There’s no way of knowing where to click next in order to keep moving along the cave. there seems to come to a point early on in the trip when you click a hand , and you just go backwards. On our recent visit to Skye I was amazed at the age and history of the area. This cave is no exception. We stayed at a B&B;near the river Snizort. On this river was the remains of an ‘aisle’ church cemetery. Had several chapels in the area. I was told the ‘moat’ and the stone wall around the perimeter were constructed to keep the predators out. Wolves, bears, etc. The area haunts me still.